Just steps from the sugar-white sands of the Gulf of Mexico, Florencia is a Mediterranean-style complex where you can see the Gulf by day and enjoy the sunsets, boat activities and lights on Ole River by night. This 1851 SF, 5th floor unit is comfortably decorated with Ceramic tile throughout and carpeted bedrooms. 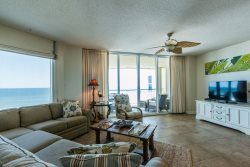 Electronics include 45” LCD TV(HD), DVD in Living Room, 32” LCD TV in Master Bedroom, 32” LCD TV in Guest Bedroom 1 and 25” LCD TV, DVD in Guest Bedroom 2. Excellent. Only one foul up a year ago and recovery was great. Michele is a pleasure to deal with. I try to deal with her every time. We have been using Perdido Realty and Michele for 5 or 6 years two to three times a year. See y'all in May. Florencia is a great place to stay with two grown daughters and three grandchildren. Since we come from different locations and meet there, three parking passes would be great. Unit 504 is perfect for our families. See y'all then. Always a pleasure. My clients enjoy themselves as I use your properties to entertain my customers. They always seem to be happy. Always quick and efficient service; we'll continue to use perdido realty for our vacation needs in the future. My family and friends really enjoyed our stay at Florencia; great location and what a view-both gulf and river; can't beat that. A nice vacation for us all. The team was fabulous. Valerie was very helpful in assisting our baseball family with accommodations last minute. When we arrived at the realty Erin was very personable,professional and helpful. She gave us many tips on where to eat and sites to see. We arrived to play baseball, however the condo's views and comfort helped us to feel like we were on vacation. Very Peaceful and Warm, comfortable and over all perfect for our family. We will definitely come again! Thank you for everything.